Never miss anything happening in your Storms again! Integrate your Stormboard account with Slack to receive instant notifications when any changes are made in your Storms. If you use Slack to regularly communicate with your team, you can now integrate Stormboard into your chats, making your workflow even more efficient. You will be able to add ideas, create new Storms, and ask for help all from Slack. You can also use "/addstorm" in any channel which will invite everyone in that channel to join your new Storm — no need to send invites separately! We've integrated with Slack to help you keep your business process and workflow more efficient and streamlined. 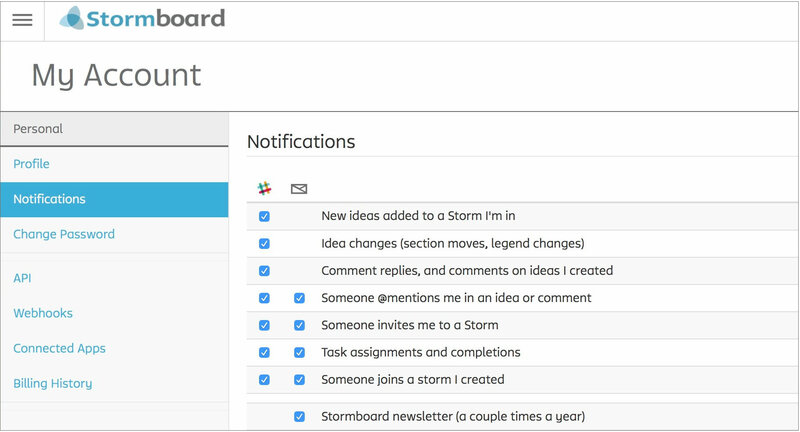 To add the Stormboard-bot to Slack, click on the "Connect To Slack" button located on the bottom, left-hand side of your Stormboard Dashboard. You can also add the bot while in Slack by searching for the Stormboard App by clicking the "+" button located next to the Apps title at the bottom of your screen. 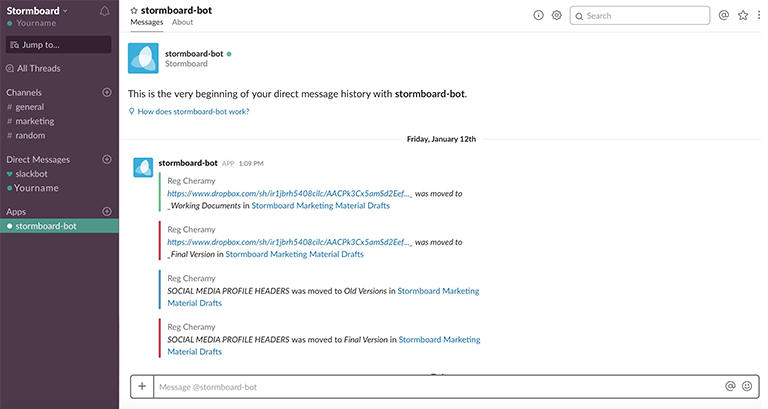 Once you have connected Stormboard and Slack, the "Stormboard-bot" will appear under "Apps" in Slack. All of your notifications will be found here. 1.Login to your Stormboard account. 2.Click on your avatar in the top right corner of your screen. 5.Add a checkmark beside the notifications that you would like to be turned on. Is there something else that you want the Stormboard-bot to do? Let us know here.